In the last few weeks, I've added two new books to my bookshelf. I honestly don't buy books that often, but I was super curious about both of these, purchased one and was reading through it when I went to work one day, my coworker had a copy of the second, and after perusing through it, I ordered it for myself. Though obviously both are totally about color, they are quite different, and I don't feel having one excludes the other. The first is The Secret Lives of Color by Kassia St. Clair, and in one way it is the most comprehensive, in that for each color it explores, there is an essay on the history of that color, overall telling 'the unusual stories of seventy-five fascinating shades, dyes, and hues.' It includes some very unique colors [such as Gamboge, Archil, Verdigris] that I find intriguing and enlightening. You'll get a good hint at its content in this post and interview with the author on 99% Invisible. 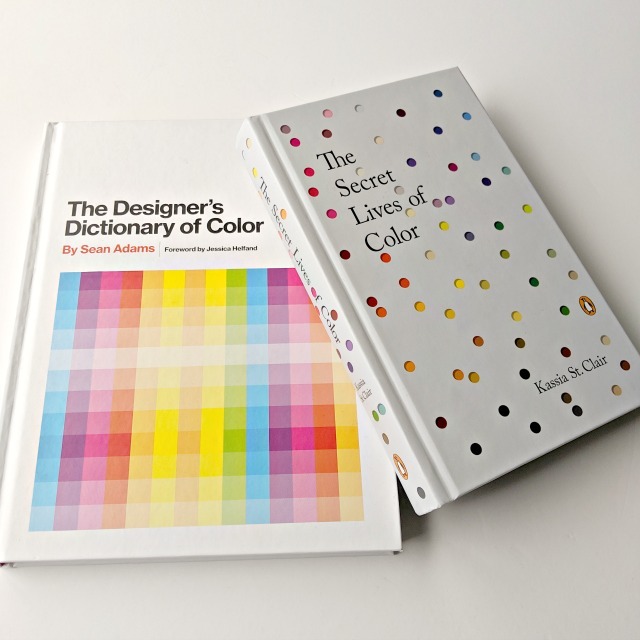 The Designer's Dictionary of Color by Sean Adams is similar in ways yet very different. It highlights nearly 30 colors, documenting each with brief histories, color range and palette variation charts, and cultural meanings. It's also beautifully illustrated for each color, more expansive in that way that Secret Lives. Here's a review from SFcrowsnest that will give you an inside look. I'm not completely sure how these two volumes will inform my future creating, but they are both definitely interesting and lovely, and I figure inviting more color into my world is never a bad thing. If you have either book, do let us know in the comments what you think and how you use them.